When children start visiting dentists in Northwest Calgary at a young age, they often skip over the anxiety that is common as they age. However, there are some children that never quite settle into the idea of sitting in a dentist’s chair; especially if they have had a bad experience in the past. If you find your children stressing over their annual check-ups or dental work appointments, there are simple steps you can take to make your dentist visit less stressful for children. Regular dental care is important for your child. If you find that they are stressed about their upcoming visit, there are 5 things you can do to make it less stressful. Your child should have their first dental visit by their first birthday. Taking them every six months after that will help establish a relationship with your dentist as well as keep them familiar with dental visits. The purpose of early visits isn’t necessarily to get them examined, but rather to get them used to the environment. Bring them along on your own routine visits just to see the different rooms and get accustomed to smells. These early experienced can do a great deal to set them up for a healthy relationship with the dentist in the future. Their first visits will generally be more about keeping an eye on the development of their teeth and jaw, and an overall look at their oral health. With properly trained staff with the right manner, your child will find these visits easy and carefree, if not even enjoyable! You can limit the negative experiences your child has at the dentist just by practicing good oral hygiene at home. Use an appropriately-sized toothbrush and have your child brush their teeth twice a day. Be gentle and never treat brushing their teeth as a chore or a punishment. Leading by example can really help children get used to daily oral hygiene. If possible, brush and floss your own teeth at the same time as your children so they see you doing it as well. By demonstrating to your children that it’s something even adults need to do, they won’t consider it as much of a chore. When your child misbehaves, do not threaten them with a visit to the dentist’s office. Also, when they have difficulty brushing their teeth or refuse, refrain from telling them they will have to see the dentist for cavities. This can create a negative stigma against the dentist’s office. Children should know that dentists are there to help. When you threaten your child with a visit to the dentist it enforces in their mind that it’s a scary place where bad and painful things happen. It can certainly be tempting to use the dentist as a disciplinary tool, but everyone — including you! — will benefit by refraining. As we said above, it is easier to get your child to clean their teeth if they see you taking excellent care of your own teeth. Also, when you go to the dentist, consider having them come along and watch. By seeing you in the chair relaxed and comfortable, they too can enjoy their dental checkup experience. It’s important if you take your child to see the dentist for you to not be afraid either. If you’re particularly dental phobic and your partner isn’t, it’s best to let them take the children to the dentist. When your child sees you panicking and getting nervous, they’ll panic and get nervous. If your child does develop cavities or complains of a sore tooth, have it checked and taken care of right away. The earlier these issues are addressed, the less intense a treatment your child will require. The less intense the treatments, the less negative associations they’ll develop with the dentist early on. Finally, do not forget to take your child to a dentist’s office that promotes a family-friendly environment. As family dentists in Northwest Calgary, our team at Dentrix Dental Care makes the dental experience stress-free for children of all ages. 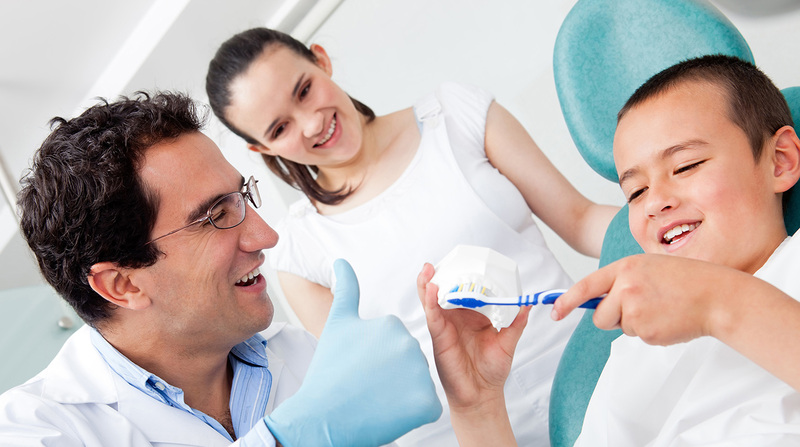 Our friendly dentists make your dentist visit less stressful for children. Schedule your child’s dental visit with one of our friendly family dentists. We are currently accepting patients of all ages. Book your appointment online now or call 403-288-5500 for Market Mall and 403-289-9908 for our North Hill office.